GPON Technology Market size is set to exceed USD 16 billion by 2024; according to a new research report by Global Market Insights, Inc. The GPON technology market growth is attributed to the massive surge in the deployment of IoT devices that generate the need for secure and reliable communication. To overcome the network connectivity issues faced by the residential and business customers, GPON plays an important role. The massive penetration of the connected devices and sensors compels enterprises to make sure that their networks continue to perform flawlessly as they transition into the IoT era. The GPON is being increasingly deployed as it has the potential to support multiple connections with varying bandwidth needs. Another factor fueling the GPON technology market growth is the emergence of 5G networks that are expected to deliver more capacity per device and support new types of solutions due to the mass introduction of Machine-to-Machine (M2M) communications. The advent of bandwidth-intensive entertainment and communication services will also accelerate the adoption of the next-generation GPON technologies over the forecast timeline. 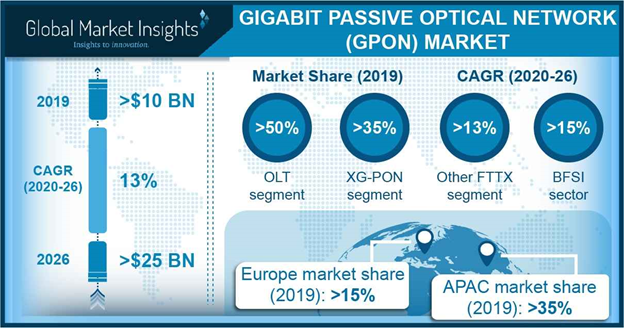 OLTs held a dominant market share of around 50% in the GPON technology market in 2017 as they are one of the essential hardware components connected at the service provider’s end, which will provide faster speed, lower latency and enable simplification of the operations in fiber networks. As these devices can serve thousands of customers, they are being used for serving modern voice, video, and data applications in high-performance enterprise LAN. Professional services are estimated to dominate the GPON technology market due to the increasing deployment, and integration of the solutions among enterprises, cloud service, and telecom service providers. These services help in reducing the overall cost of operations of organizations and increase their revenue by eliminating the maintenance expense of physical IT infrastructure and hiring contract employees. These advantages will drive market growth over the forecast period. The NG-PON2 segment in the GPON technology market is projected to grow at a CAGR of around 20% over the forecast timeline. The technology enables service providers to converge their multiple services into one, reducing the overall cost of the network. NG-PON2 holds a great potential for commercial users as it allows providers to deliver dynamic bandwidth to any subscriber at any time and helps them to converge all services for business, consumer, wireless-wireline on a single fiber network. The NGPON2 market will exhibit excellent growth over the forecast timeline as it supports multiple wavelengths and offers a higher combined bandwidth for bandwidth-intensive services. Mobile backhaul application segment will show the fastest growth rate of over 10% in the GPON technology market. With significant investments aimed at commercializing 5G network technology, the demand for efficient mobile backhaul solutions in the telecom sector is projected to increase sharply. The FTTH segment is estimated to hold a major portion of the market share in 2024 as it promises higher speed as compared to a typical cable modem or Digital Subscriber Line (DSL) connection. FTTH also allows bundling different services, such as cable TV, broadband with Gigabit speed, telephony, CCTV, IPTV, smart home applications, and safety & security services, through a simple FTTH broadband connection. The IT & Telecom segment dominated the global GPON technology market in 2017 and is expected to hold a share of over 50% in 2024. As the telecommunication networks are constantly developing and expanding in order to meet the ever-growing user demands, the demand for GPON technology in the sector is likely to increase swiftly. With the ongoing expansion of 4G networks and investments aimed at the commercialization of 5G, subscribers are increasingly using broadband data services for their smartphones. This will trigger the adoption of GPONs to meet the high-bandwidth demands, increased scalability, and low latency in data transmission. Asia Pacific GPON technology market is estimated to experience the fastest growth with a CAGR of around 7% over the forecast timeline. The GPON technology market growth in the region is driven by an increased penetration of services such as Video on Demand (VoD) and IP television (IPTV) transmission along with high-speed internet access networks. To meet the escalating network demands, the operators are installing Passive Optical Networks (PON) and Gigabit PON (GPON) solutions. Another factor driving the market growth is the significant investments in IoT to drive the smart cities initiatives. Due to the growing popularity of IoT networks in building smart transportation and smart buildings, the demand for fiber optic cables to handle the data transmission over the networks will increase significantly. The companies operating in the GPON technology market are focusing on modernizing their network infrastructure to offer low-latency and high-bandwidth services to the customers. The GPON technology market is projected to experience a high growth due to the several efforts taken by the service providers to adopt new networking technologies. Due to the rapid increase in mobile traffic and the emergence of advanced mobile technologies, the need for efficient backhaul solutions is being increasingly recognized by Communication Service Providers (CSPs). The service providers such as Calix offer modern backhaul solutions with end-to-end performance monitoring capabilities. In June 2018, Frontier Communications Corporation deployed Nokia’s XGS-PON1 technology to deliver faster broadband speeds to business and residential customers. The new solution enhances the reliability and flexibility of the network to support mobile backhaul requirements. Some of the major players of the market are Adtran, Alphion, AT&T, Broadcom, Calix, Cisco, DASAN Zhone, Ericsson, FiberHome, Hitachi, Huawei, Iskratel, NEC, Nokia, NXP, Semiconductors, Tellabs, Unizyx, Verizon, ZTE, and Zyxel.